Ever since I was a little kid flipping through the pages of my Zoobooks, I knew that someday I wanted to travel to Africa and go on a safari. I wanted to see wild lions and herds of zebra and big-eared elephants – probably not much different than what many of you have dreamed of. 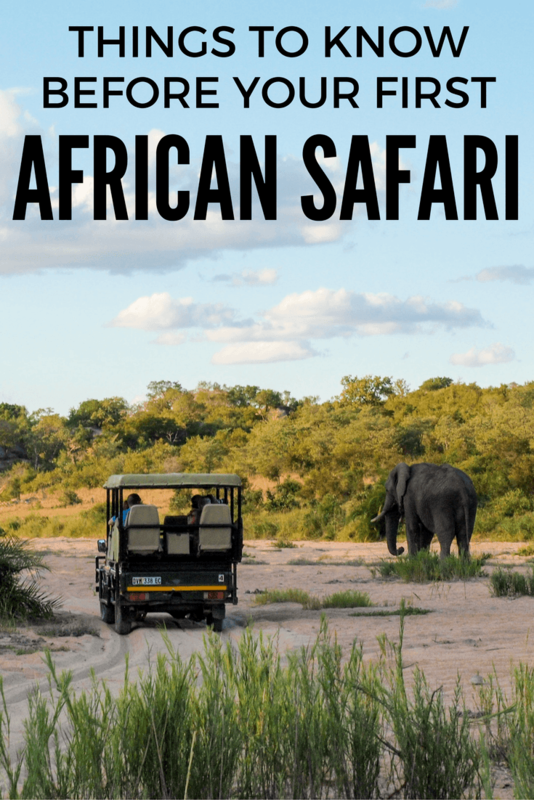 And after finally getting to do all of that last year during a 5-week trip to Southern Africa, I can tell you that going on safari is just as amazing as you've probably always imagined. In fact, I think it's even better in real life! The private game drive is what most people think of when they think “safari,” but there are actually so many different options! My first safari experience was in South Africa with my dad, where we went on 2 private game drives per day in Kruger National Park. I then traveled overland with Acacia Africa and went on self-drive game drives in Etosha National Park in Namibia, a walking safari in the Okavango Delta, and both land and water-based game drives in Chobe National Park in Botswana. Regardless of how you go on safari, though, I think there are some things worth knowing before you go. Animals aren't really the same as people – they're most active right at first light and again around dusk. And this means that you can expect some very early starts to your safari game drives. In South Africa, our morning game drives would begin between 5:30 and 6 a.m., and then we would be back at the lodge around 9 a.m. for breakfast. This timing was great because it meant we got to see the sunrise, as well as all the animals that are more active in the early morning hours. Even if you're not a morning person, force yourself to be one for those early game drives. Thinking of skipping one of those early morning game drives in order to sleep in a little longer? Well don't! No two game drives will ever be the same since you're dealing with wild animals in a non-controlled environment. You won't ever see the exact same things if you go on multiple game drives. Take the game drives I went on in Kruger National Park. On one drive, we saw a month-old baby rhino with its mother, and two male lions challenging each other over territory; on another we watched a huge herd of elephants playing in a riverbed, and then caught a pair of lions mating; and on another drive (our very last one in Kruger) we saw a pack of super-rare wild dogs challenging a group of hyenas. And of course the more parks and protected areas you visit, the more opportunities you'll have for unique sightings. In Chobe, for example, we got to get up close to hippos safely in a boat, and even got to watch elephants swimming! Even though you might be tempted to skip a game drive, using the excuse “well I've already been on a few” to justify a couple more hours of sleep or a nice sundowner drink at the bar, I would reconsider. You might miss the best sighting of your whole safari! Of course, there are no guarantees when it comes to safaris. After all, we're talking about wild animals in huge national parks here, most of the time without any fences or barriers to hamper their movements. While most animals do have a general territory that they stick to, it doesn't necessarily mean that you'll see them in it. While it's true that you have the same chance of seeing animals in a national park as anyone else there, where you decide to stay definitely can have an affect on your overall safari experience. In Kruger National Park, my dad and I stayed at the Jock Safari Lodge, which is a small private lodge right on the edge of the park. The rooms and food were amazing, the staff was so friendly, and many of the rooms have a view out over a riverbed – meaning you can see wildlife without going anywhere. In Etosha National Park in Namibia, my overland group stayed at the Okaukuejo Rest Camp, which offers both campsites and more luxurious chalets. The highlight here was the watering hole right on the edge of the camp that was lit by floodlights after dark. We saw elephants, rhinos, giraffes, and more come to drink after dusk just a few steps away from where we were camping. There are so many places to stay, regardless of your budget or how you're traveling. My advice is to choose a place that not only meets your accommodation needs, but that also will give you the chance to see wildlife from the lodge/camp itself. It's like bonus game drives! Don't get discouraged, though, if you've been out on a game drive for a while and haven't seen anything yet. The rangers who work in the parks (and especially for the private game lodges) are extremely good at what they do. They are also very good at communicating with other rangers in the area to find out where the best sightings are taking place. At some lodges in Kruger, you'll go out on game drives with both a driver and a “spotter” to give you the best chance of seeing animals that blend in really well with the African bush. During my stay at the Jock Safari Lodge, though, we were assigned the head ranger for the duration of our stay, and he acted as both our driver and spotter the whole time. We trusted him completely when it came to choosing routes through the park and deciding when to leave animals in peace. Our trust paid off, too – he put us in the right place at the right time to catch that pack of wild dogs (even HE was giddy over it since they're so rare in Kruger), and even piled us back into a vehicle after a game drive had ended in order to show us some leopards. You might be curious about how you can rumble around in a huge safari truck or a boat right alongside a bunch of hippos and not scare the animals away. And it's a good question! Look how close we are to these rhinos! This does mean, though, that when you're around predators or potentially dangerous larger animals, your ranger will tell you to keep very still and quiet and not hang any limbs outside the vehicle – because this can single you out as being separate from that innocuous “truck-animal” that most animals see. Contrary to popular belief, there's really do dress code when it comes to safari game drives. You don't have to wear head-to-toe khaki or anything like that. Because, again, remember that most animals don't see you as a person in a safari truck – they see the entire truck as a big animal. The only time when you'll be asked to wear neutral, natural colors is if you're going on a walking safari. In that case, your ranger WILL tell you what you should and shouldn't wear so as not to spook or attract any animals. A warm layer – I was in southern Africa in May and June, which is autumn/the beginning of winter in that part of the world. And it CAN (and does) get cold when the sun isn't out. You'll want a warm layer for early morning and late evening game drives. In Kruger, we were provided with blankets in our safari truck, but on my sunset cruise in Chobe we had to bring our own layers. Sun protection – Lastly, you can always get sunburnt, even in the winter months. Be sure to be prepped with sunglasses and sunscreen, and some long sleeves and pants if you're likely going to be in full-sun. And, even though it’s not a tangible item, but I also always recommend packing a good policy! That way everything from lost luggage to a bad accident is covered – because you just never know! I recommend for basic (and really affordable) travel insurance. Chances are if you're going on safari you want to get some great wildlife shots to take home and show off. In order to do this, you'll need a decent camera and a long telephoto lens. While you will sometimes get really close to animals, you're more likely to see them from a short distance away for everyone's safety and comfort. I had an before going on safari, and purchased a telephoto lens (the ) before I left. This was SUCH a good investment, as most of my safari photos were taken on this lens. And if you'd rather rent a lens than buy one, check out Borrow Lenses, where you can rent all sorts of lenses and camera gear. If a safari is something on your bucket list, don't put it off! Southern Africa especially is very safe right now, and a strong US dollar means you can get a lot for your money. Is an African safari on YOUR bucket list? Are there any other tips you would give to first-timers? I love the photos! This is all super helpful, especially where you stay. I probably wouldn’t have thought about that much in terms of wildlife sighting. I’m living in Wyoming for the winter and wish i had a better zoom lens for all the bison and moose around here. I might have to invest in one now! I didn’t really think about wildlife sightings at your accommodation, either, but I noticed after my trip that the spots where it was easy to spot animals from your room/common areas were definitely the ones that I remembered the most! And yeah, I decided to buy my zoom lens instead of renting one because I’m sure I’ll use it again on future trips! Your animal photos are drool-worthy! I kind of feel like I’m there when I’m looking at them! I’ve had another trip to Africa on my radar for quite a while, and this makes me want to go even more badly. I definitely will be back, too – hopefully sooner rather than later! I’d love to go to Kenya and Tanzania next time! 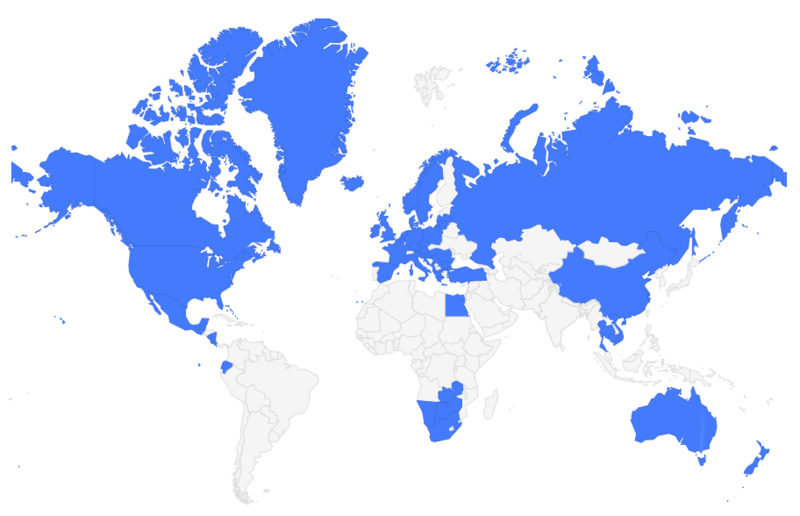 Those and Madagscar and Uganda are high on my list too! Oooh yes Madagascar! I SO want to go see all the lemurs! Hello Akatuki, I am Kenyan by birth i have also lived here all my life apart from the few times i have gone out to see other parts of the world. Kenya has about 23 terrestrial national parks and 28 terrestrial national reserves, 4 marine parks and 6 marine sanctuaries. There are many more private and community owned sanctuaries. In the parks there are enough lodges and campsites. The most popular is the mara because of the great wild beast migration. Delta operates a direct flight from Atlanta to Nairobi and plans are underway to have Kenya airways take on the same route. Ethiopian will fly you here as well via Addis Ababa although there are many more connecting flight paths. I will create a blog to share with you the pics and much more info about this spectacular piece of land. I will also try to get hotels and other logistics providers to see if they can offer back to back budget packages. I am saving up for a trip in 2019. Seeing your photos makes it hard to wait. These are great tips! I’ve never been in such place before but I dreamed about it. I wish I could visit Africa sooner. You are so fortunate to experience this African safari and see these animals in your own eyes. Btw, I love your photos and your blog is worthy to read. I am very fortunate indeed, and I try not to forget it! Good tips. Be very careful with sun exposure, especially in countries near the equator. It might feel like a mild 80 degrees, but you can burn in minutes. It’s important to do safaris with a guide. For one thing, they see things you will miss. For another, they know where to go. But most importantly, they know how to keep you safe. I lived in Kenya for two years, and the parks and wildlife there are spectacular. Yes and yes! Sunblock is definitely important no matter where you’re traveling, and having an experienced safari guide is definitely worth it! I’ve been lucky enough to see Kruger twice and do an Intrepid Serengeti trip during the migration. What I think is also important is that you can book a DIY trip in Kruger pretty easily–and it won’t break the bank. We did a short 4-day trip last year and it was amazing. Definitely bring a warm layer and something to keep the hair out of your eyes, since the safari vehicles are open! Yes, Kruger is really easy to do on your own (as is the rest of South Africa, really), which is awesome. I would love to visit the Serengeti during the migration sometime! Spot on with this post!! I did my first safari in Kruger in August and it was one of the highlights of my LIFE! Actually just published a post on it last week! We got super lucky and saw the big 5 twice!! It’s definitely a once in a lifetime experience…but I already want to go back and do another one! I’m thinking Namibia :). Namibia is awesome! It’s quite a bit different than South Africa (especially when you get further north and into Namib-Naukluft and the dunes!). Learning that fact about the animals made everything make so much more sense! And yeah, definitely check out Borrow Lenses if renting a lens is something you’re going to do soon – they have so many! Ahhh, you’re making me long for a second safari. I’ve only ever done one in the past—&Beyond in Kruger with my mom about seven years ago—and it was epic. I’ve heard such amazing things about &beyond! This looks like a truly incredible experience! It really is! I know getting to Africa isn’t the easiest/cheapest, but I think it’s so worth it! Great tips, Akatuki. 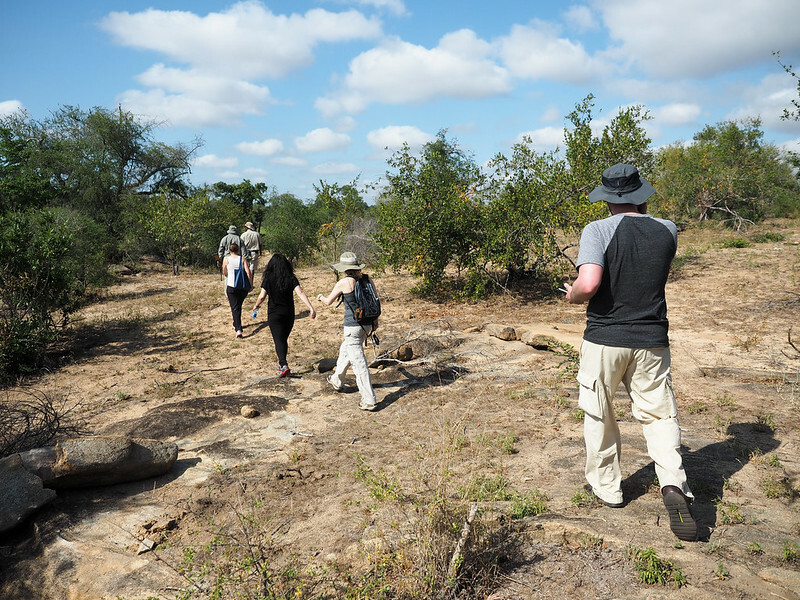 It sounds like you had a great guide in Kruger! 2017 is a great year for it, especially if you’re from the US (the US dollar is so strong right now and the South African Rand so weak that you get a lot more bang for your buck!). These are great tips and I really love your photographs! I’ve been on safari in both India and South Africa. And being quiet is a most important issue so as not to attract attention, as well as listening to the advice of your guide. It can be quite disconcerning when you’re in a private truck and a wild creature is just a few feet away from you. I was a little anxious let me tell you! p.s. your tip about having warm layers is spot on. I was in India in October/November, and the early hours are not as warm as you think. I was in South Africa in April, and the weather wasn’t that much better than in Berlin where I live either! I was expecting sunshine, and what we got was cloudy, windy, take-your-jumper-and-scarf-with-you kind of weather lol! People always assume that everywhere in Africa is just hot. But South Africa is pretty far south, and it does get cold! I was overlanding in late May/early June in Namibia and Botswana, which meant sleeping outside in tents. And it got COLD at night, let me tell you! I had to buy an extra blanket! The warm layers are as important as sun screen and sun shades here. You will experience different weather here until your body will give up on trying to acclimatize. For instance, if you jet into Nairobi in the morning it is not uncommon to find complete fog and temperatures in the ranges of 60 degrees, July is the coldest and February the hottest. it is not a surprise to record 30 degrees around the central province of Kenya yet at the coast and the north will easily clock over 80 degrees. Kenya is astride the equator, with 5 degrees south and 5 degrees north. The entire 580 thousand square kilometers are a climatic opposite. So come prepared to encounter all kinds of weather here. Hey Akatuki, those photos are simply stunning! Sharing your post in a bit. Thank you! You are going to love it so much. I just love your post! I’m South African and it’s wonderful to read about the experiences visitors to our beautiful country have. My hubby grew up in Mpumalanga where the Kruger is so we have regular visits there throughout the year. And we live about 3 hours drive away. Because it’s just a stone’s throw away we tend to not always be as excited as we should be. But your pictures have inspired me to spend more time actually enjoying our regular Safari visits to the Kruger. It’s so easy to take for granted the things we have in our own backyards! But Kruger is indeed very special – lucky you that you live so close! Thanks for making me realize how lucky I am to be so close to a place that’s so special! We’re off on a trip to Namibia later this year and I’m looking so forward to it! You are definitely lucky – and Namibia is amazing! I’m sure you’ll love it. This looks amazing! I think I just moved “Go on a safari” a little higher up on my bucket list! Mission accomplished! Yay, great to hear! It certainly is an amazing experience! An African Safari is absolutely a bucket list worthy adventure. I bet it’s life-changing to see those beautiful animals in their natural homes and up close. It’s definitely an experience I’ll never forget! Great post! We are heading into Kruger in the Sabi Sands region in October. We are beyond excited, I’m not even sure we’ll be able to sleep before the first morning game drive. We love hearing about how amazing these experiences are! You will have such an amazing time! Akatuki, i am humbled at your effort in showing what we have around here in Africa. You can think of these lands as raw and uncut. For instance Tsavo East National park has a land mass of 5,308 mi² while Tsavo west has 3,500 mi² these are huge landmasses that have nothing but game, caravans, camps and lodges. The Elephants here are red in color while you will find those in Meru national park taking grey color. This is nothing to do with genetics. When you come around we will tell you why. The zebras are found along the Mombasa- Nairobi highway closing freely. The elephants can be spotted along the road especially during dry spells. Now, the Kenyan standard gauge railway line passes through the pack with an elevated bridge that allows an aerial view of the park. Remember to take the train when you arrive here. I’m looking forward to my first safari next year. We’re pretty sure we’re going to go on a South African safari. My question is about the early mornings. I’m not naturally a morning person, but then I’m also traveling from the western United States so I’m thinking the jet lag will help make it easier to force my schedule to adjust…. We’re leaving for Egypt and South Africa next month, and I just bought this camera to prepare! I’ll try to find a used version of the lens you recommended. Question–how did it perform in low light, and did you bring a tripod? I got the cheapest 300mm lens available (there’s a way more expensive version, but it didn’t make sense for me since I knew I wouldn’t use it that often). I didn’t use it a lot in low-light, though I did take some video on it in the dark when our ranger used a spotlight, and it worked fine for that. I also did not take a tripod with me, because you won’t be able to use one in a safari truck anyway.